Go See This contributor Molly Court gives us a round up of the upcoming Bee in the City trail. A swarm of 100 super-sized Bees are making their way to Manchester this summer as part of Wild in Art’s latest creative adventure and Molly Court let’s us know exactly what to expect from the city’s new additions. Bee in the City is one of the biggest public art exhibitions to take place across the city. The giant honey bee sculpture trail is inspired by the worker bee. Mostly referred to as the Manchester bee, it symbolises the industrial past of the city over the last 150 years. Recently, the worker bee signified unity and defiance across the city in the wake of the Manchester Arena Attack. The free family-friendly trail will be exhibited across the city from 23 July until 23 September. The trail is set amongst the city’s landmarks, hidden gems and areas that visitors are yet to explore. The Bees will be made up of everything from acrylic paints to glitter, decoupage, mosaic and recycled materials. The Bees are sponsored by local or national business and each bee sculpture will be decorated with its own unique design, created by regional, professional, and emerging amateur artists. Expect an amazing array of designs showcasing a range of styles, techniques and themes. Oasis frontman and Manchester icon Liam Gallagher recently added the finishing touches to his very own rock ‘n’ roll Bee. An unbee-lievable surprise and just one of the spectacular creations soon to appear. Accompanying the super-sized Bee’s will be 130 smaller bees, decorated by up to 30,000 children and young people across Manchester. The schools and groups are part of Bee in the City Learning Programme. The Bees will be made up of everything from acrylic paints to glitter, decoupage, mosaic and recycled materials. Other designs may creatively incorporate the school or group mottos. The community Bees will go on public display in city centre venues including Central Library, Manchester Cathedral, the National Football Museum and the Royal Exchange Theatre. At the end of the trail each school or group will be able to keep their Bee and put it on permanent display for their young people to enjoy. Wild in Art is one of the leading creative producers of spectacular, mass-appeal public art events, which connect businesses, artists and communities through the power of creativity and innovation. 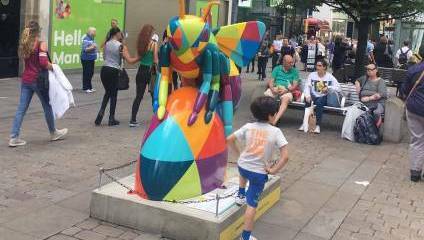 After the trail the larger sized Bees will be auctioned to raise significant funds for The Lord Mayor of Manchester’s charity, We Love MCR. The charity was set up in order to improve the lives and life chances of Manchester people. Find out where the bees are near you on the Art Trail map! Win a copy of Red Joan the book!